More leadership changes in the Government can be expected in the next few years as the pace of political succession quickens, said political observers yesterday. The promotion of two acting ministers to full ministers next Tuesday also shows that preparations by the third-generation leaders to hand over the reins to a fourth-generation team are well under way, they added. Institute of Policy Studies deputy director Gillian Koh said: "We're in succession planning mode. Some very senior ministers who have had their portfolios for a long time may be prepared to cede way to people who are worthy." National University of Singapore (NUS) political scientist Bilveer Singh said: "I will not be surprised if we see more of such changes in the coming months - if not next year - as the third generation prepares to pass the baton to the fourth." They were also confident that Mr Ng Chee Meng, Acting Minister for Education (Schools), and Mr Ong Ye Kung, Acting Minister for Education (Higher Education and Skills), will be at the core of the new leadership, strengthening further the team that will take over from that of Prime Minister Lee Hsien Loong. Mr Lee has said that he plans to step down after the next general election, which must be held by April 2021. 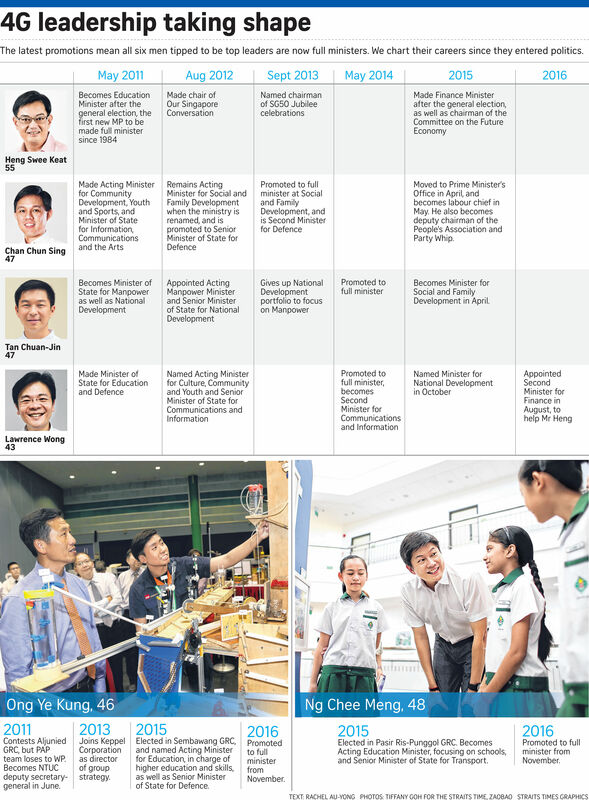 Besides Mr Ng and Mr Ong, other ministers tipped to be front runners for the top job are Finance Minister Heng Swee Keat, labour chief Chan Chun Sing, Social and Family Development Minister Tan Chuan- Jin and National Development Minister Lawrence Wong, all four of whom entered politics in 2011. Yesterday's announcement of Mr Ng's and Mr Ong's promotions affirms that the leadership renewal process is moving along steadily, said the political observers. Both men, elected for the first time, joined the Cabinet as heavy hitters, said Dr Koh. "There is nobody who ranks higher than a former chief of defence force - Mr Ng Chee Meng. And Mr Ong Ye Kung had many years in public service and exposure in NTUC (National Trades Union Congress). He's not someone learning Public Service 101." But while their promotions confirm them as contenders for the post of prime minister, they do not indicate if one is higher up the hierarchy than the other, or ahead of his peers. Dr Koh noted that it was deliberate that both men have second portfolios to expose them to a wide range of issues. But the promotions should also not be seen as a race, said Dr Singh. "Both are relatively new in Cabinet politics and the PM has added them to the top echelon of political leadership," he said. "How far they move up depends on how they perform, whether they take on additional duties, how they connect with voters and how they are received in the party that must decide their No. 1 leader. They must also have international presence." In the meantime, the two men's colleagues have welcomed their promotions. Marine Parade GRC MP Seah Kian Peng, a member of the Government Parliamentary Committee for Education, said both men come across as confident and committed. Mr Seah, who has worked with Mr Ong in the labour unions, said he is impressed with how Mr Ong has brought the same energy to his political role. "Selling an idea is one thing, but you can see he believes in life-long learning." Potong Pasir MP Sitoh Yih Pin, who as chairman of the Government Parliamentary Committee for Transport interacted closely with Mr Ng, who is Senior Minister of State for Transport, said: "He is not only a good minister but, more importantly, a good man who works for the best interests of Singaporeans." NUS political scientist Reuben Wong expects the fourth-generation leaders to swop portfolios in the next 11/2 years. He said: "PM will want to try them in different portfolios, and from there we can see how they perform."